Posted March 25th, 2016 by David Firth & filed under AI/Artificial Intelligence, App Economy, Big Data, Business Analytics, Business Intelligence, IT Trends. The floors of the New York and London Stock Exchanges now exist mostly for show. 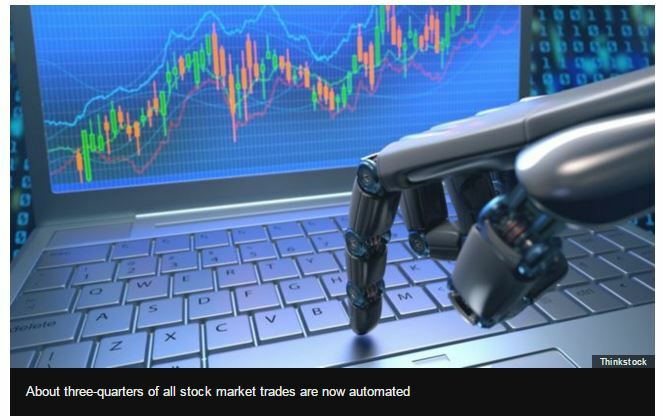 The real trading is done automatically by robots. About three-quarters of trades on the New York Stock Exchange and Nasdaq are done by algorithms – computer programs following complex sets of rules. And this “robo-trading” is having a profound effect on the investment world, from global hedge funds right down to personal savers. But what are the advantages and disadvantages of allowing computers to manage the world’s trillions of dollars? 1) “WiseBanyan co-founder Vicki Zhou says her platform allows people to invest algorithmically through a diversified portfolio of low-cost index funds…and they don’t charge the management costs normally levied by traditional funds.” If you are investing in low-cost index funds, do you really need an algorithm as well to help you? 2) “Some think a more likely scenario is that all these self-learning trading algorithms, accessing all the market-relevant data there is to know, eventually converge to a single view, leading to stagnation in the market.” Does this makes sense to you, and how would you be able to avoid this (which is essentially what physicists call entropy)?